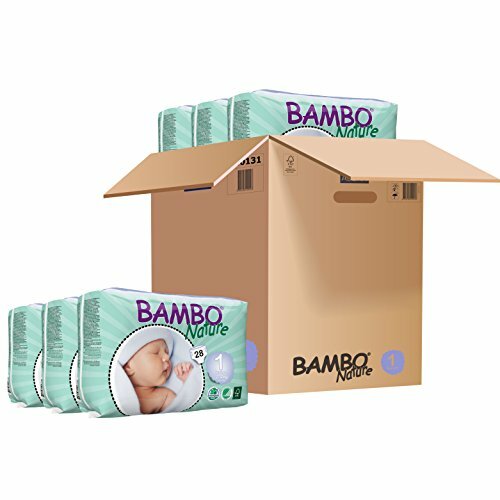 Bambo newborn nappies are breathable and highly absorbent. These newborn nature nappies are 50% bio-degradable and free from harmful chemicals… naturally the best nappies for your newborn baby. These nappies undergo a modern oxygen bleaching process and are free from harmful chemicals, making them kind to baby’s skin. This nappy was awarded the Nordic Swan Eco Label – your guarantee for the most environmentally compatible choice. Bambo newborn nature nappies contain a fabric-feel polypropene layer, absorbant pulp material, wheat starch and polyacrylate. The fabric-feel back sheet is made from polypropylene, polyethelene and calcium carbonate. The hook and loop closure system is made from polypropelene. The glue used is hot melt made from resin and wax. Size to fit: 4-9lbs, 2-4kg, nappy size 1Bambo eco nappies are breathable and highly absorbent. They are Nordic swan Certified, 50% bio-degradable and free from harmful chemicals. Bambo nappies have a starch based absorbent core and a latex free waistband and cuffs. They are free from chlorine, perfumes and lotions. High absorbency ensures a dry topsheet and the perfect fit gives your baby maximum comfort. NEW BAMBO NATURE NAPPIES. NEW DESIGN. SAME GREAT NAPPY. Are you guilty of being a competitive mom?